Call Branchburg Oral, Maxillofacial and Implant Surgery Phone Number 908-218-0300 to make an appointment at our Branchburg office. The procedure to place a dental implant takes 30 to 60 minutes for one implant and usually 2 to 3 hours for multiple implants. The number of appointments and time required, vary from patient to patient. Dental implants can be placed using local anesthesia or under IV sedation/general anesthesia. These different options will be discussed at your consultation and you and Dr. Maloney will decide on which option is best for you. First the surgeon makes a small incision in the gum tissue to reveal the bone, then creates space using special instruments, and finally inserts the titanium implant. The gum tissue is then closed with resorbable sutures. A follow up visit is then scheduled for 1-2 weeks later. 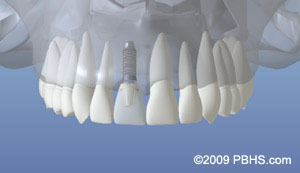 Implants are often placed 2-3 months after extraction. At times, an implant may be placed immediately after extraction of a tooth. This may involve a little more risk, but greatly shortens the overall treatment time. 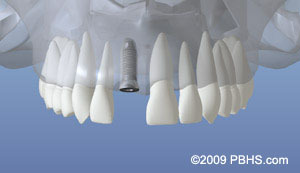 When infection or other problems with the bone are present, immediate implant placement may not be an option. If your tooth has been missing for some time, the adjacent supporting bone is likely to shrink. This occurs because the root of the natural tooth has to be present to stimulate the bone. If you don’t have adequate bone present, you may benefit from having additional bone grafted into the area either before or during the time of implant placement. Need more information? Would you like to make an appointment? Call our office at Branchburg Oral, Maxillofacial and Implant Surgery Phone Number 908-218-0300 to speak to a staff member.